The Pekingese is one of the oldest dog breeds in the world. The Pekingese dog breed started in ancient China where only the Imperial family were permitted to own them. They were bred for religious purposes, but they became the pet of the emperors and his family. Pekingese were royal pets and they were treated royally – which can help to explain their temperament. Common people had to bow down to a Pekingese, if one of them were to pass nearby. The penalty for being cruel to or removing one from the royal palace was the death penalty. The British brought the cute dog breed to the Western world in 1860 by way of a presentation to Queen Victoria. The Pekingese is, historically, quite an influential breed. It’s appearance in England in 1860 jump started the creation of many of the breeds we know and enjoy today. From the video “Creation of the Pekingese Dog”. Because of the middle class, the arrival of this tiny Chinese dog in Queen Victoria’s London court in 1860 was to have far-reaching consequences. The Pekingese was created not by the harshness of an environment, but by the power of religious beliefs. Also known as the “lion dog”, the Pekingese was recorded to have been kept in China at the time of the Shu dynasty 2,000 years ago. China had recently become a buddhist country, but this conversion faced a significant stumbling block: the lion, which Buddha had tamed, creating a faithful servant and powerful protector – didn’t exist in China. Faced with the need for such a powerful religious symbol budhhist monks turned to dogs for the answer and chose the puppies most likely to help. The Pekingese was molded into existence by breeding from the smallest, hairiest dogs the monks could find to produce a miniature lion. They were so successful, that the dogs became sacred symbols owned exclusively by the Imperial family. Removing them from the palace precinct was a crime punishable by death. The Pekingese is one of the earliest breeds with a written standard, setting out exactly what the animal should or should not look like. In 1860, the summer palace in Beijing was stormed by English troops, heralding the end of the mighty Chinese Empire. The Imperial dogs – carefully bred and nurtured for many centuries were slaughtered – to prevent them from falling into foreign hands. But 5 of the animals survived unnoticed in the chaos. These dogs were brought to England and the smallest one was presented to Queen Victoria. Its tiny legs and flattened snout caused a huge stir and became a fast favorite in high society. Owning a lap dog was the ultimate status symbol. And for the newly moneyed middle classes with time on their hands, it was just the inspiration they’d been looking for. Breeding dogs and keeping them as pets, or the “dog fancy” as it was known quickly became the hobby of choice and an affordable opportunity for the middle classes to produce their own versions of the elite’s essential canine accessory. 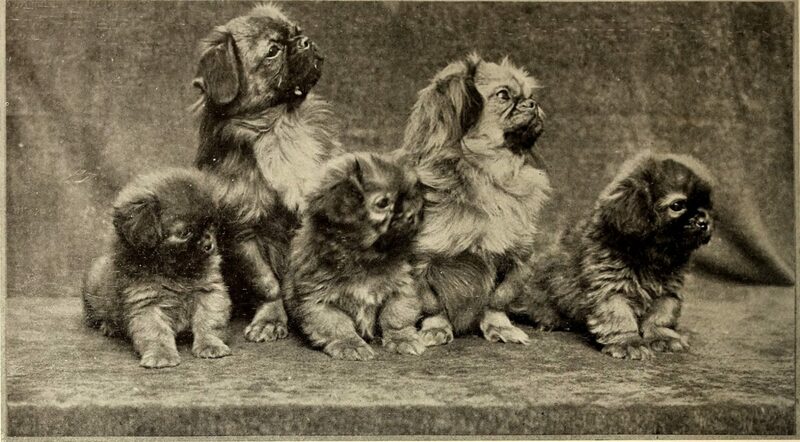 * Banner image from page 43 of “American homes and gardens” (1905), with the caption: A group of Pekingese, the little spaniels originating in China The House Dog By T. C. TurnerPhotographs by the Author, via flicker, No known copyright restrictions.